My experience with the bass goes back almost as far as my experience with the electric guitar.. I mean, in some ways, they are never far apart. A “band” traditionally has both. When I started playing electric guitar back in junior high school, there were three of us playing on our mom’s classical guitars, but one of us, John Taloff, had an older sister who went out with a bass player, so he was seemingly always headed down that path. So his electric bass, a Fender Jazz bass copy from some unknown 1970s Japanese brand, was one of the first ones I played. The other guitarist, Steve Cammack’s stepdad had an old Fender Mustang (Competition Orange!) that I played a couple times, but couldn’t really borrow that one. We were into Fender gear, for some reason. Maybe the cool ads with the hookah-smoking caterpillar, maybe Jimi Hendrix’ band, maybe John Paul Jones. Anyway, we were first into Fender anything, but couldn’t afford it so we got copies. Anyway, while I was playing LEAD GUITAR in Bürnt Toast and playing rhythm guitar in some other band of high school kids (I don’t remember the name), the piano player in this other band asked me one day, Hey, you play guitar, I bet you can play bass too, right? I said, sure, of course… So I got to play bass in a band of OLDER dudes… these guys were in their 20s, man! They played at actual bars. JT with the ’65 Rickenbacker. Steve on my fake Strat, I’m on the brand new Rickenbacker 481. This was Bürnt Töast playing at Whole Earth Day on the UCD campus in April 1980, I believe. OK, so a couple notes on the aesthetics of bass playing. In 1978 or so, when this was, bass playing had developed in rock music in so many ways and so many styles, but in California the prevailing wind was that to be a cool bassist, you played with your fingers like the big guys (John Paul Jones, Billy Cox, John Entwistle) resorting to a pick only if you could be like Roger Waters. This was of course prior to the ultra coolness of punk playing. And even with Chris Squire being part of Yes, his style was weird and was his own. So I had to learn to play with my fingers like a real bass player if I was going to do it, because I wasn’t going to be one of those bass players who plays like a guitarist playing the bass. Though, to be fair, in many ways Paul McCartney plays somewhat that way. I learned pretty quickly that outside of rehearsals in the actual gig, I had to play pretty hard to keep on top of things. I knew enough to play on the drums, and my chordal theory was pretty well developed to know the right(ish) notes to play, and could always come back to roots and fifths. 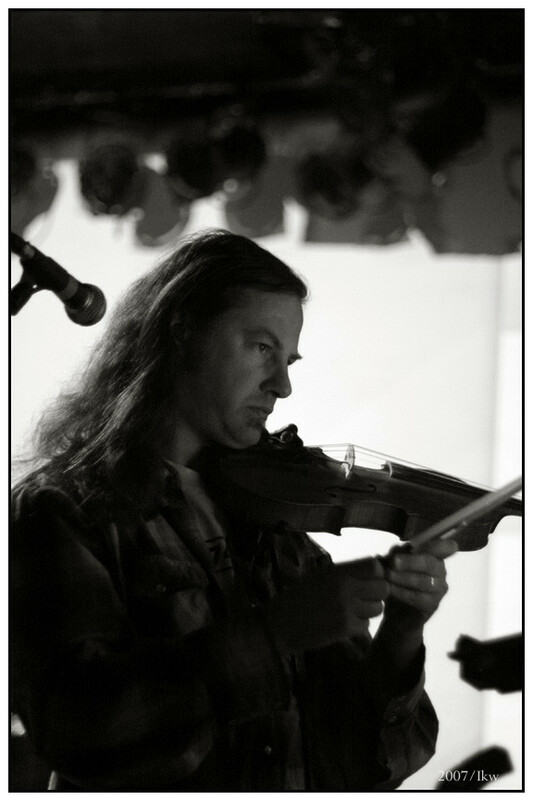 When we played the Grateful Dead songs, I stretched out a bit and played more melodically—even though I didn’t actually know that Phil Lesh played that way to begin with. I got blisters pretty quickly, way before callouses on my right hand. So, I did end up having to play with a pick by the latter half of the sets (which I felt was cheating!) Also, I think I realized that I was probably never going to have the hand strength to actually be a bass player in a band. Luckily I was actually more interested in playing guitar. 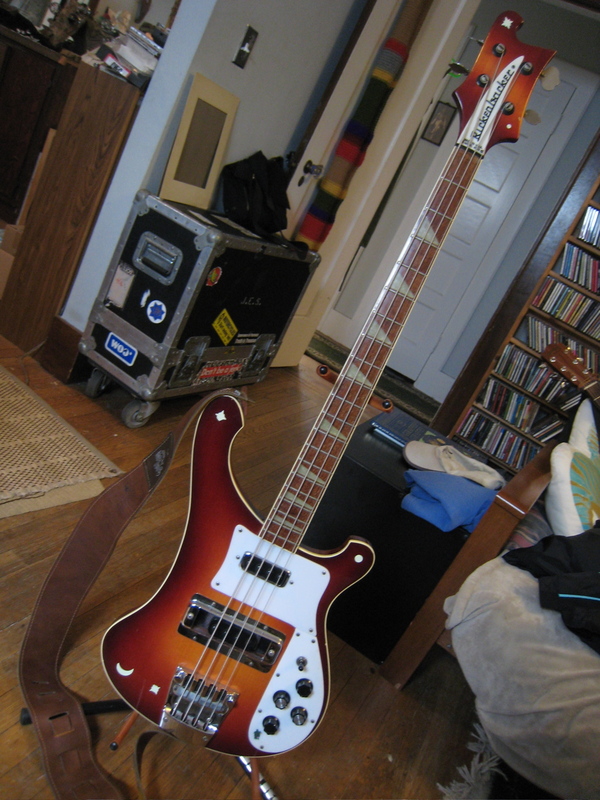 Plus, John, the bass player in my “real” band (Bürnt Toast) got another bass, a 1965 Rickenbacker 4001. Totally beautiful, maple-glo natural. I enjoyed playing it also, and got to borrow it for the O-san band. However, Rickenbackers, old ones anyway, have a weird set up where the bridge pickup has a cover (this was a ’65, so a year after the horseshoe pickup that was there before) that most players took off to be able to play directly above the pickup, BUT: the sides of the metal pickup ring that was still there had pointy little corners poking into the pickup area. SO when playing with your fingers, inevitably you would pluck the string and immediately poke your finger on the metal point. Ouch! They fixed this a few years later, so I see now. Anyway, I would end up switching to a pick pretty quickly with this bass, which made it sound even more guitar-y. In 1980, the guitar player guys in the band were calling off all gigs in October (I think) because they would be going to see the Dead at the Warfield, and were very amazed that we hadn’t seen them ever. Well, how ’bout that? Really, at this point I had the greatest hits LP and that was it. Me and John Taloff listened to it, and I showed him what I had been playing on the bass. So they gave me and the keyboard player tickets to one of the shows, sitting in the 4th row at the Warfield (yes it was seated!) The first set was acoustic. That was ok. Pretty slow, I thought. But then, they took a break and nobody went away. I was wondering what was going on. So after a while, they came back for a second set, which I thought was cool, because at the time, none of the bands I had seen had done two sets, and most of them were doing 45 minutes at the UCD coffeehouse or Freeborn Hall and then off. Elvis Costello only played 30 minutes! Anyway, during the second, the electric set, I realized that Phil Lesh was incredibly loose and melodic and barely playing anything like a “normal” bass player. Which I also thought was cool and I wanted to be able to do that. Except he also had to keep the beat, because their drummers apparently couldn’t. So after the second set, still nobody left. I was no stranger to acid, but we had only smoked a joint at this show. I was wondering how long the Warfield people would let the crowd hang out. But then after a while, the band came back for a third set! I was astounded. What a deal! My overall impression of the show was that most of their stuff was dang slow, and I wasn’t into Jerry Garcia’s tone much, but they were OK. John, the owner of my borrowed bass, really went with this music, however, and the next year when I went to UCSC to go to college, he went on tour with the Dead. Oh well. I have always felt responsible for that. At UCSC, of course, many people were into the Dead. So sometimes when people in my dorm hall would have jam sessions, a lot of it was Dead songs, which I knew now. I tried playing guitar a few times, but then in the music department there was a woman who played bass, and she decided she was never going to play the electric bass again, only the upright contrabass, so she was selling her 1972 Fender Precision. $350. I bought it immediately. This bass has really served me well, and many other people who have borrowed it, not the least of which is Victor Krummenacher, bassist from Camper Van Beethoven and the Monks of Doom, who has used it several times on tours or recordings. I never really played bass in a rock band after high school, though I did play in an improv band in college called EPI. This stood for many things, whatever we felt like writing when we played, for example, at Sluggo’s Pizza at College V (Porter) where people mostly ignored us (thankfully.) For a bunch of these shows, actually, I ended up borrowing David Lowery’s bass that he played in Box O Laffs, which was some weird Fender, a fretless Precision neck on a Jazz bass body. Very weird, but he was an awesome bass player in Box O Laffs with it, it was perfect. For EPI, I played it as jazzily as I could, which wasn’t saying much. Our band was with a trombone and drums and guitar also. Mostly. Victor demonstrating how to play the P-bass with no hands. At some point during the late 1980s I managed to get another Rickenbacker bass, a 1982 4003 model, bought from Anne Costanza from the Whitefronts (later Lords of Howling, now Art of Flying.) I recorded a bunch with this bass for things on Storytelling, the first Hieronymus Firebrain CD and the first of the Plane Crash Tapes. I found one great sound combo that I really liked was to use the Rickenbacker and double the roots with Moog bass synth, or Taurus pedal sounds… Like Rush and so many other prog bands. And now Gösta Berlings Saga also! The Rickenbacker 4003. Why did I have to sell it? One cool thing about the Rickenbacker was that it was a very inspirational instrument, that is, I wrote a bunch of bass lines and riffs whenever I picked it up. Many became songs. In fact, it even made an appearance on Camper’s New Roman Times, in the title track… that riff was from that bass, and the bass itself is still in the breakdown verse at the end of the song. Strumming bass. For the most part I don’t like to play bass on my own records because I really like what other people come up with (plus I know people who are better bass players than I am). I have always loved Victor’s playing on my songs when he has recorded with me, and in Jack & Jill, Jane Thompson really played some cool parts—she was a very melodic bassist also, preferring to sound out the parts rather than even starting from trying to learn what chords were used. After Jack & Jill, though, Jane had moved to Davis for Grad school and I had moved to LA, so I ended up playing all the bass parts on Scissors and Paper, (on the Fender, mostly) which I think came out really well. (Did you know that I played everything on that album except drums and where Jane or Alison faith Levy sing? Oh, and Chris Xefos and LD Beghtol play toy piano and sing a bit.) Chris Xefos also plays some amazing bass on several of my songs, for example, “Listen” on All Attractions. This is simply hands-down better than what I would have come up with if I had had to do it myself! 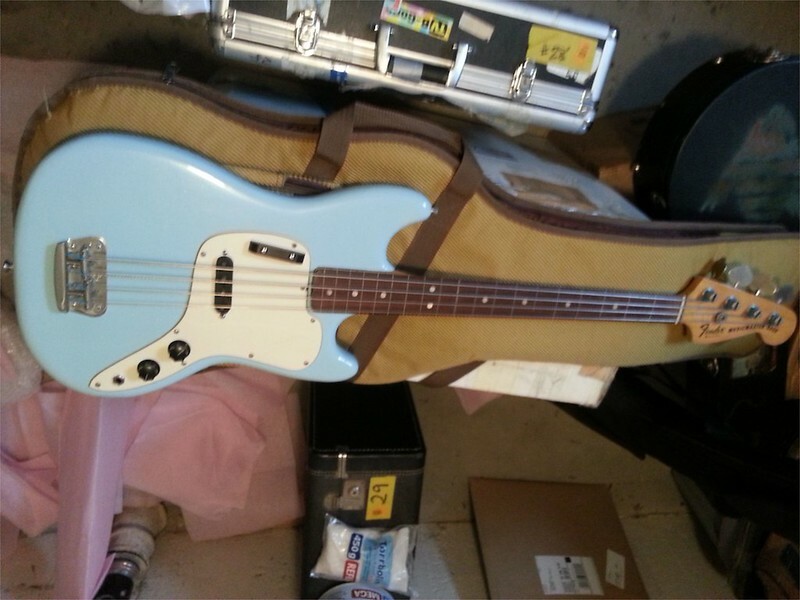 I’ve always wanted to get a Fender Mustang Bass, but haven’t really ever had the right opportunity. I did find a cheap fucked up Musicmaster ($75!) that had been stripped and the frets sanded so that it was “fretless”. The pickup didn’t work, so I got a Seymour Duncan 1951 Fender P-bass pickup and sanded the bobbins a bit till it fit. This bass sounds incredible. I’ve used it for recording a bunch of my dance company music, or just ‘extra’ music. It’s got flat wounds on it. Really incredible tone, for whatever reason. I eventually refinished it, in Sonic Blue. I meant to get Daphne Blue, which is actually the color they used on Musicmasters, but fucked up when ordering from Reranch. Still, it looks ok, not the best refin, but whatever. My wife Sanna also has a Musicmaster, a 1978 wine-red one that’s pretty nice. Actually used on one song as well “Here Come the Warm Milk” because for whatever reason that was the only bass in the house when I needed to have the bass on that song. 70s Fender Musicmaster, no frets, refinished. I unfortunately sold the Rickenbacker in 2009, thinking, hell, I’m not really a bass player anyway. I totally regret it, of course, and want one again, if only for writing. Ok, and recording. So, I’m not really a bass player. But I’m pretty good at it in limited doses. 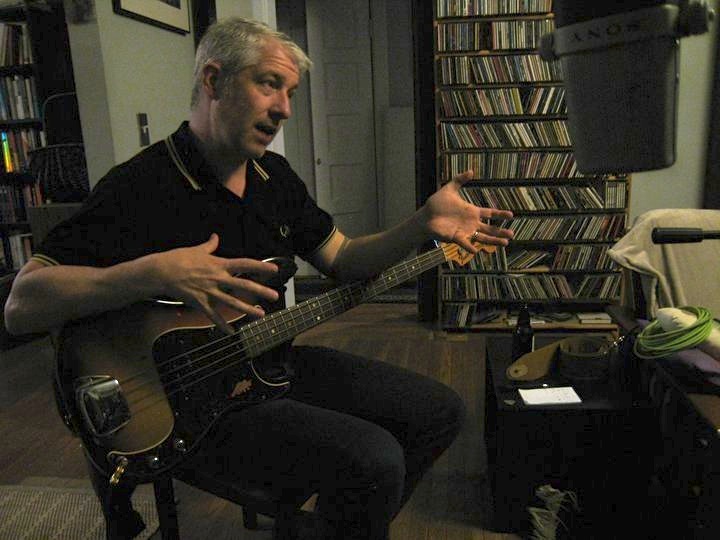 What is a real bass player, anyway? That’s a hard question. We all know, for example, that despite the fact that John Paul Jones is an excellent keyboard (etc.) player, he is a great bassist. And a “real” bassist. (He plays with his fingers most of the time!) And we also know that bass playing, real bass playing, is not playing guitar on the bass. There are so many ways, of course, to be that part of the music, but a great deal of it is being the hinge between the two moving parts: drums and (as one great bassist, Paul Olguin puts it) the “sound effects”. And that changes with different kinds of songs, whether to play with the kick drum, before it or behind it, with the guitarist or the vocals, all sorts of things. Some people think bass players shouldn’t be busy, yet many of the best can whip it out at the right points and outdo the lead guitarist. Some people think good bass playing is sticking to the root of the chord on the downbeat, period. I guess all that says is that there’s no real rule. Some people like Lemmy strumming away on a Rickenbacker with the treble turned up, some people like the occasional root played with the tone knob rolled down cutting any treble. Or the mute-bass sound, like mid-Beatles (I dug up the bridge cover for my P-bass, complete with decaying mute during the writing sessions for La Costa Perdida, and that was the bass in the living room at the time. That had some influence I think…) And most of us like all of these things in the right place at the right time. And in the end, that’s really what bass playing, (ok, any music) really is anyway. ‹ Pandora, now a year down the road from me. great article, and don’t blame yourself for my being a deadhead, jon – it would have happened anyway. And I met my extremely wonderful wife though the dead (besides it was mark damiani that took me to my first show). It’s not necessarily a bad thing… I listen to more Grateful Dead nowadays than I did then. Though most of it is from 1969 or so. My first bass was a brand new red Musicmaster. It had flatwound black nylon strings. I got it in the summer of 1976 when I was 15 and decided I wanted to play bass instead of guitar. (I was trying to play Live and Let Die and was having trouble getting from the G to the Bm and realized it was a lot easier if I only had to play a single note instead of a stupid bar chord.) In 1979 I traded it in toward the purchase of an Ovation Magnum 1. (Look! Ross Valory played one: http://www.youtube.com/watch?v=wovLoyU4tlg) I still have the Ovation but I can never seem to get a good tone out of it. I regret selling the Musicmaster. I have no real recollection of what it sounded like, but I’d like to still have it for sentimental reasons. It was nice of you to not say that bass players are just people who couldn’t handle the guitar. That’s really the common misconception isn’t it? That the guy who played guitar least well had to play bass? (and the next worst played drums.) But it’s a different animal. Hey thanks for the write up JS – that was enjoyable! Yep – Bass was Fender Mustang (Competition Orange!) with 3 red race strips and I think the only barrier to borrowing from Jan was not asking. And free to bororrow anytime now as it’s sitting idle 10 feet from me – Oh and the BT venue was Whole Earth. I remember Noelle attended while she was still recovering. My Dad was there as he left Nepal to visit when she got ill. Cheers! Very interesting. I started playing the bass in my 8th grade band. I wish I still had the gear I came up with in 1978. Of course of Japanese P-Bass copy. A Harmony hollow body bass. all run through a big Kustom rig. Used to rattle the entire house. My brother wanted to learn an instrument so my parents rented him a drum set. Once I saw that thing I put the stringed instruments down. No loss. I sucked even worse than I do on the drums. As a drummer a simpatico bass player makes my life easier and when we groove you have a band. I’ve played with some who just wanted to play a blaze of notes with no concern. We never get along well.